The much needed rain finally arrived on Easter Sunday. We also had a good number of heavy showers yesterday. Total for the two days was 48mms or almost 2 inches. We did have a fish just as the rain arrived on Sunday. 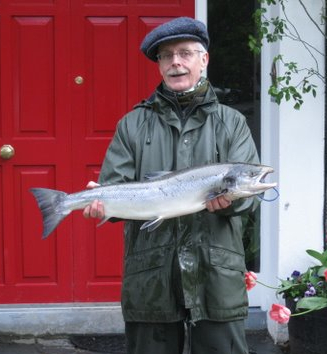 Arnold Crook had a fine fish off Finlough of 11lbs3ozs on a Sunrae Shadow. It was indeed well earned as Arnold had fished hard in very difficult conditions. I have often noticed in the past that when rain finally comes it takes a day or two for the fishing to pick up. However this was not the case as we had two yesterday even with the river a little coloured. Martin Cellier had a sea liced fish of 9lbs 6ozs off the Turn Pool later on. This was taken on a Willie Gunn and netted beautifully by his wife Barbara. This morning Jonathan Murray from Antrim had a sea liced fish off the Rock Pool of approx. 8lbs. This was taken on a Willie Gunn. The river is now running at 35 and even though it is cold we should get enough showers to keep it at a good level. Hopefully we will see a few more silver bars in the next few days.